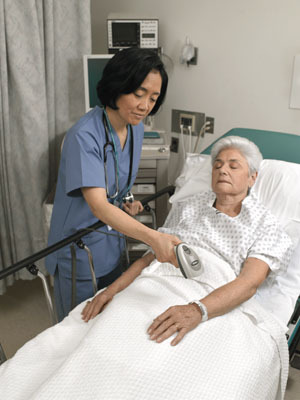 Hospitals in Australia are struggling to cope with demand and an ageing population. Everyday they are asked to do more with less resources and money. To save money you sometimes have to spend money. Motorola and Zebra offer a range of barcode scanning and barcode printing solutions to help reduce medical errors, improve patient safety and enhance caregiver productivity. Please review these videos to see how a barcode scanning and/or barcode printing system might help your hospital improve. Unchain your caregivers from the nurse's station and give them the freedom to access information in the palm of their hand while on the move. You'll never want to use pen and paper again. 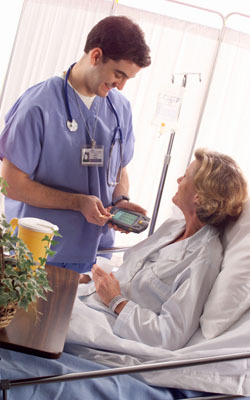 See how using a hand held Motorola mobile computer connected to real time information can improve patient care and reduce medical errors. Motorola installs over 300 access points to cover two former hotels that have been converted to hospitals. Hospitals all over the world are faced with a major issue — how to reduce the errors that take place every day — errors that are measured not just in dollars, but also in harm to patients.